At the end of August 2013, the renewal of the historic Brafferton drew to a close, allowing the occupants to return in advance of the new academic year. The President, Provost, and members of their staffs are enjoying the brightened rooms and 21st century infrastructure the renewed Brafferton now offers. The Brafferton, part of William & Mary's Historic Campus, has undergone a complete renewal. The project began in the summer of 2012 and addressed the preservation as well as the safety needs of the building. The updates are the first major work on the property since it was part of the Colonial Williamsburg restoration in 1932. Historic building restoration and preservation specialist Peter Post '78 contributed his 18th century brick working expertise to the Brafferton renewal project. Since the floor was lowered beneath the building's foundation, the exterior walls of the cellar were reinforced with concrete. New cellar floor slab was poured, on top of which salvaged 18th century bricks were re-laid. A new drainage system was installed under the floor in the cellar in order to divert rain water away from the foundation walls. New interior cellar steps were installed, allowing for easier access. Demolition of divider walls on the third floor began. Throughout October, William & Mary, the contractor –Virtexco – and the architect – Grieves, Worrall, Wright, & O'Hatnick (GWWO) – met to discuss the project. The building was prepared for construction, and steps toward renewing its plumbing and renovating its cellar were taken. The door frames, banisters, floors, windowsills and exterior steps were covered with plywood in order to protect them from accidental construction damage. The contractor confirmed the size and location of the piping by cutting small, precise rectangles in the walls. Throughout the building, the walls were opened to remove outdated insulation. Water, drain, waste and vent plumbing lines (most of which date to the 1932 restoration) were removed from the building interior, to be replaced by modern pipes. 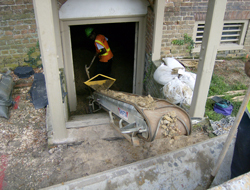 In order to ultimately lower its floor for the purpose of installing a bathroom, construction workers began to excavate the cellar by hand, and used a conveyer belt to remove dirt from the building. In September, William & Mary finalized its contract with Virtexco Corporation, the same contractor responsible for renovating the Christopher Wren building in 1999-2000. 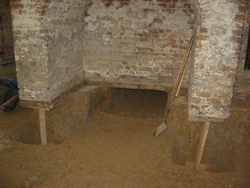 During the summer, the cellar of the Brafferton was excavated by a team lead by Mark Kostro – a Colonial Williamsburg archaeologist and anthropology doctoral candidate at the university. This investigation continued the work done during the archaeological field school in 2011. The excavation provided new insights into the building's design, and revealed drainage equipment from the late 1700s, indicating that the control of ground and flood water in the Brafferton cellar was an issue faced by the building's early residents. At the end of the academic year William & Mary President Taylor Reveley and Provost Michael Halleran vacated their offices and relocated to James Blair Hall in order to accommodate the construction project. The President and the Provost will return to the Brafferton in the fall of 2013. President's and provost's offices temporarily relocated to James Blair Hall while renovation work is completed at the Brafferton. Archeologists spent 10 weeks digging around the foundation of the university's second oldest building, with some interesting discoveries. The Colonial Williamsburg Foundation conducted its 27th annual archaeological field school at The Brafferton in conjunction with William & Mary. In preparation for work on the building's foundation, two five-week field school sessions focused on the building exterior. The field school, led by Mark Kostro, included undergraduate students, anthropology graduate students and archaeologists from Colonial Williamsburg. William & Mary publicly announced the Brafferton Project. William & Mary is raising funds to renew and preserve the historic Brafferton. The William & Mary community honored students of the Brafferton Indian School, housed at W&M from 1723 until the Indian School was discontinued at the time of the Revolutionary War, with a special ceremony on April 30th.